How Ultrasonic Cleaning Works | Process Equipment & Supply, Inc.
Ultrasonic sound is sound transmitted at frequencies generally beyond the range of human hearing. 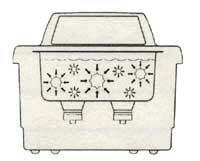 In your ultrasonic cleaner, ultrasonic sound (sonics) is used for cleaning materials and parts. This is how it works. 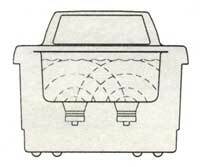 As the sound waves from the transducer radiate through the solution in the tank, they cause alternating high and low pressures in the solutions. During the the high pressure stage, the bubbles collapse, or “implode” releasing enormous amounts of energy. These implosions act like an army of tiny scrub brushes. They work in all directions, attacking every surface and invading all recesses and openings. Heat: Increases the chemical activity of cleaning solutions. Load Size: It is faster and more efficient to run several small loads than one big load. Placing Items: Never allow items to sit on the bottom of the tank. Place them in a basket or beaker or suspend them in the solution. Solution Level: Maintain the solution level within one inch of the top of the tank. Heating the Solution: The fastest method to heat your cleaner is to fill with warm solution, use heat, ultrasonics (which also adds heat) and a cover. Degassing: Fresh solutions contain many dissolved gases (usually air) which reduce effective ultrasonic action. The solution will degas by running the ultrasonics. Surface Tension: Can be reduced by adding chemical to the water in the bath. 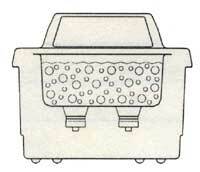 Reduced surface tension will increase cavitation intensity and enhance cleaning.